Here's the scene, Pearl Jam is playing the second night of their Away Shows at Fenway Park (2018). The, Noles, Pants, and I have tickets. And, when that crew gets together, it's time to have a few (craft) beers and cause some mischief. That is where the Cheeky Monkey Brewing Company fits in. Fenway Concert, so Fenway Bars! 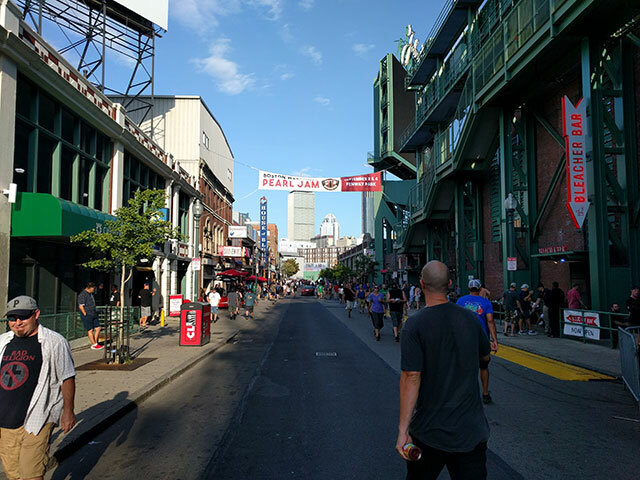 Pearl Jam @ Fenway (2018 Night #2) and Craft Beer, quite the combo! Drink delicious craft beer (2018, 2017, 2016, 2015, 2014, 2013, 2012, 2011, 2010, 2009, etc. - you get the point). Getting a chance to do both was exactly what the Doctor McGillicuddy ordered. We’ve been to Boston Beer Works, The Cask, The Lansdowne Pub, and a bunch of other Fenway Bars plenty of times. Anyway, that said, we had yet to visit the Cheeky Monkey Brewing Company. So, here are our notes. Where is the Cheeky Monkey Brewing Company located? The brewpub, which is more of a full blown bar that brews beer, is located below Jillian’s Boston, at the site of the old Tequila Rain, next to Fenway Park on Lansdowne Street in Boston. Of all the restaurants near Fenway, this microbrewery might be the least restaurant-y. But, it’s a step up from Fenway Park food. So there’s that. However, if you are looking for cheap beer in Boston, parking yourself at a Fenway Bar, let alone a craft brewer, probably isn’t the wisest idea. What exactly is a cheeky monkey? Yeah, about that. If you are of a certain age, and watched early 90’s SNL, you might remember Mike Myers taking a turn as an effervescent British Boy who called people a Cheeky Monkey. The brewery opened a year ago, in the Fall of 2017, amidst a sea of other Fenway Bars, including another brewery, the long-standing Boston Beer Works, just around the corner at 61 Brookline Ave. Looking out toward the bar and Lansdowne St.
No formal tour that we know of. 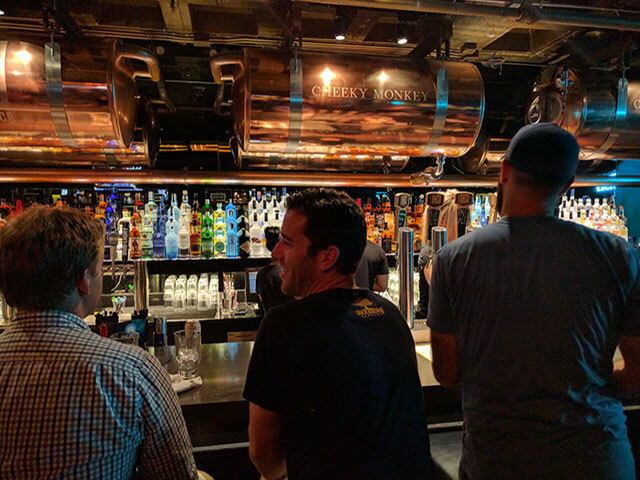 If you are taking a Boston Brewery Tour, feel free to stop at the Cheeky Monkey. However, it isn’t a must. I believe so. At 8pm, it becomes 21+. Parents, I am not sure if there is a baby changing station in the bathrooms. What types of beer does Cheeky Monkey brew? A few different types. 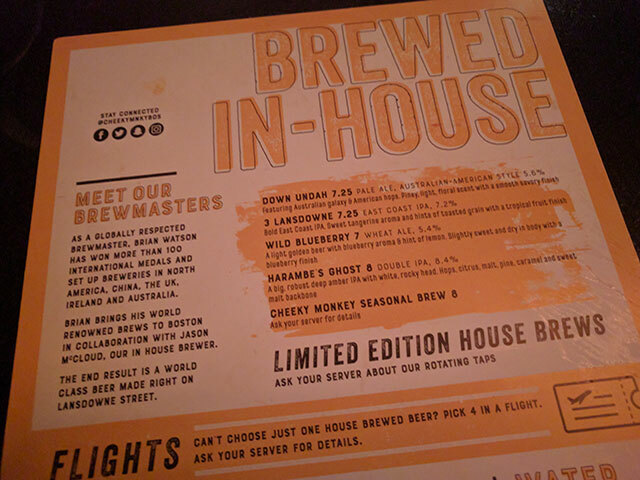 The Down Undah pale ale, a Wild Blueberry ale, the 3 Lansdowne Citra, East Coast IPA, Harambe’s Ghost, a DIPA, and the rotating craft beer tap of the night was a Habanero Ale. The Habanero ale was surprisingly delightful. Had a bit of zip to it. They offer beer flights, but we were sticking around for a bit. Why get a flight when you can get a pint of each, right? Not that I saw, but Pants and I were more interested in getting inside Fenway for Pearl Jam. Does Cheeky Monkey serve other types of alcohol? As I learned in NYC a long time ago, a pint and a shot is **one drink**. To Nat King Cole, Cheers! Oh for sure. They’d be foolish not to. 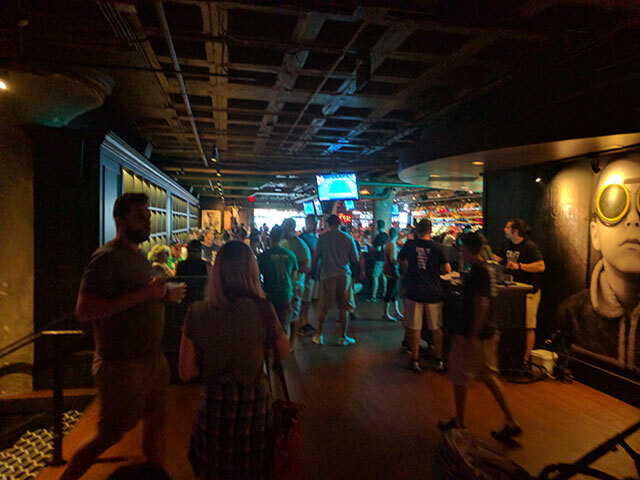 The tap room sits on the doorstep of summertime’s all campus rager, the home of the Boston Red Sox, Fenway Park. Didn’t stop to ask. Didn’t notice one. Does Cheeky Monkey serve food? Yes. I wouldn’t say a robust, Cheesecake Factory-sized menu. But they offer just enough. The Sausage & Fennel flatbread wasn’t too bad. The El Camino of Breweries ... Restaurant in the front, Pool Hall in the back. Billiards! 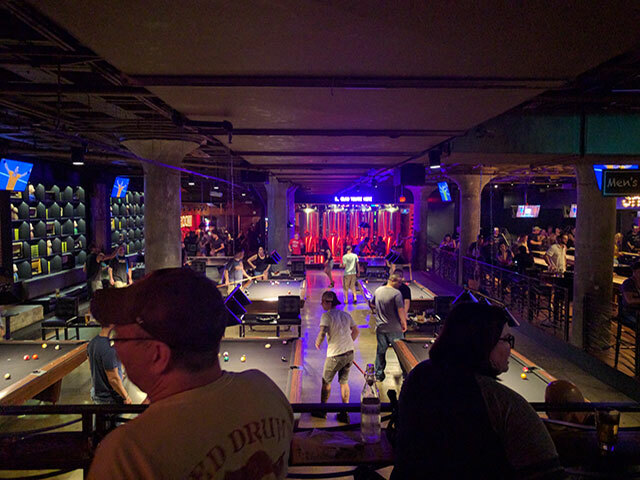 A handful of pool tables for you and your buddies while you wait for the Sox game to start. Come to think of it, I’m a bit surprised they didn’t have any ping pong tables. Some rumor of puck shuffleboard. Didn’t see it, but maybe it was there. If you are looking for music, go check out the Lansdowne Pub next door. Ahhh, Jake Ivory’s … you are missed. Can I buy Cheeky Monkey beers in stores? No. I believe they are only sold on-site. Pretty solid place to grab a pint before a Sox game, a Fenway concert, or a show at the Boston House of Blues. Definitely give the Harambe’s Ghost a shot, and if they are still serving that Habanero Beer, get after it.